High quality 6-ft (1.8 m) OBD-II cable, with molded connectors, strain relief, external shielding, and twisted pairs for differential signals (PWM and CAN). Ideal for environments with high levels of electromagnetic noise. This cable was designed with European diagnostic connectors in mind (they're often molded into the dashboard). 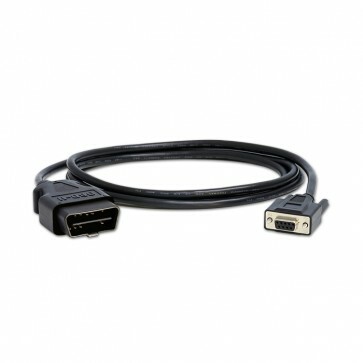 This is the standard cable shipped with our scan tool interfaces. Designed with the European market in mind. The thin shell allows the cable to mate with J1962F connectors built into the dashboard. This cable features very good noise immunity. The BUS+/BUS-, and CAN High/Low lines are twisted pairs and external aluminum foil shielding. 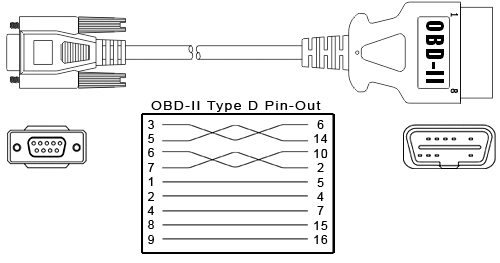 Warning: The OBD-II cable is designed to be used in conjunction with ElmScan family of interfaces (or other interfaces, which isolate your computer from the vehicle's electrical system). Plugging the cable directly into the PC may damage the serial port.